Best part: The enrapturing performances. Worst part: The laboured pace. Today, our news-media system delivers more threatening news stories than ingenious ideas. Instead of travelling in the appropriate direction, commercialised new reports unnervingly pump stories into the airwaves. One momentous story shook the world back in 1993, but has taken a couple of decades to come into prominence. The West Memphis Three saga hit Middle America harder than any political dilemma, Fox News controversy, or racial conundrum could ever hope to. This story, thanks to the good ol’ money-hungry Hollywood forces, is now the subject of a star-studded yet bloated docudrama. Mishandling the invigorating material, Devil’s Knot, based on Mara Leveritt’s 2002 book of the same name, becomes yet another ambitious yet underwhelming biographical account. Given a dodgy release date by the Hollywood cash machine, this crime-thriller has seemingly been forgotten by everyone associated with it. With its starry cast and intriguing director/writer team, this docudrama could, and should, have honoured this devastating true story. Following on from such influential documentaries as the Paradise Lost series and Peter Jackson’s 2011 hit West of Memphis, Devil’s Knot doesn’t even leave a fingerprint on those features. Examining this potent subject matter with ambiguity and verve, the aforementioned documentaries gave us conclusive insights into this topic. Embarrassingly, Canadian stage and screen icon Atom Egoyan (Exotica) tries to push those expository efforts out of the way. Arrogantly, this acclaimed director, thanks to his blinding gaze, delivers a one-sided account of touchy events. His feature starts off with the true story’s horrific facts. The narrative begins with modest married couple Pamela and Terry Hobbs (Reese Witherspoon and Alessandro Nivola) stressing over the whereabouts of Pamela’s son, Stevie Branch, and his friends, Christopher Byers and Michael Moore. Contacting the authorities, the couple watches on in horror as a missing persons report is filed. Finding their bodies several days later, the police, along with private investigator Ron Lax (Colin Firth), further examine this life-altering tragedy. As we know, a month later, gothic teenagers Damien Echols, Jason Baldwin, and Jessie Misskelley Jr. were arrested and charged in connection with this appalling crime. From the opening scene, it becomes painfully clear that Egoyan and screenwriters Paul Harris Boardman and Scott Derrickson are afraid of the material they’ve taken on. The saying goes: “If it ain’t broke, don’t fix it”. Sadly, by developing a fictionalised/dramatic account of this event, Egoyan and co. step too far outside their comfort zones. Bringing his unique style to this heartbreaking true story, Egoyan’s effort delivers more stylistic flourishes and brash opinions than groundbreaking touches and invigorating sequences. This TV-movie-like interpretation, by painting in broad strokes, doesn’t tell us anything new about the case. Avoiding neutral touches and invigorating concepts, Devil’s Knot awkwardly jumps from one depthless plot-point to the next. Unsurprisingly, the opening sequences reflect those of Gone Baby Gone and Mystic River. Introducing potent themes and dangerous characters, this crime-thriller delivers an exhaustive amount of red herrings and societal boundaries. Throughout the first third, the camera lingers on a broken town hindered by this destructive event. as rednecks clash with authoritative figures, Egoyan’s account immediately begins pointing fingers and naming names. Forcing one-or-two people’s viewpoints into each frame, this crime-thriller’s narrative rubs critics and filmgoers the wrong way. Looking down upon the deep south’s cultural practices and disturbed communities, caricature-like performances and heavy-handed symbolism ruin this otherwise well-intentioned docudrama. 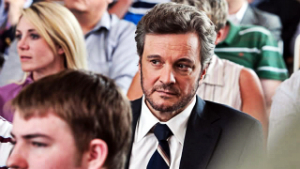 “The state is gonna kill three men, and I can’t stand by and watch that happen.” (Ron Lax (Colin Firth), Devil’s Knot). 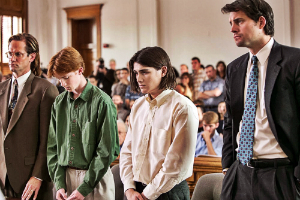 One of many courtroom scenes. The narrative, moving beyond the monotonous detective-drama plot, sluggishly transitions into a cliche-ridden and laughable courtroom drama. Amicably, this section analyses the police department’s disgusting miscarriages of justice throughout the investigation. However, attempting to turn into a concoction of To Kill and Mocking Bird and Primal Fear, the movie’s ever-pressing conflict tries and fails to develop clear-cut heroes and villains. Bookmarking certain clues and scenes, some factions are depicted as stereotypes and apathetic hindrances. Egoyan and co. may as well have written “Bad Guy” on certain characters’ foreheads. In addition, Egoyan’s unsubtle visual style draws bizarre conclusions throughout the intricate narrative. Telling and showing us certain actions and reactions, the characters’ testimonies become irritating, narration-driven interludes. Sucking the tension out of this discomforting crime-drama, his experimental visuals – adding specific filters, grains, and editing tricks to dreary scenes – drown this feature in inappropriate flourishes, kooky moments, and trite storytelling beats. Further harming Egoyan’s vision, our eclectic performers are mistreated within significant roles. Firth, despite tackling a different type of role, is woefully miscast as the straight-laced investigator and bitter divorcee. Sharing valuable scenes with Mireille Enos, Amy Ryan, and Elias Koteas, Firth struggles to maintain his raspy, hick-drenched accent. Witherspoon, putting on weight for this project, is stranded in a one-note role. Her character, despite being the emotional core, is left to sob heartily throughout a needless subplot. In her defence, she fares better than Dane DeHaan, Kevin Durand, Bruce Greenwood, and Steven Moyer. Placing its director’s vision and sycophantic viewpoints above the material, Devil’s Knot carries a wavering pace, dour tone, and tiresome genre conventions toward its shallow finale. Preceding cinematic endeavours, analysing the issue and developing vital interpretations, drastically overshadow this insufferable effort. Predictably, this unnecessary and obvious docudrama says nothing new about the West Memphis Three saga. If it ain’t broke, don’t break it just to gain attention. Verdict: An ambitious yet bland misfire. With the writing and directors. You would think this would be a good one. Sorry to hear this one was disapointing I will watch the documentaries before I watch this.